How are you with No? Last week’s blog-post was about asking for help. And, if we are to develop true skill in asking for help we need to grow our capacity to handle No – both the no inside ourselves and the no we may meet in another. Many of us find it excruciatingly difficult to feel or express our own No’s. We were never taught the importance of our own boundaries or shown by others a respect and value for our No’s. And so we develop our lives and relationships, with an absence of No’s, often mistakenly thinking we will be more liked or wanted if we do that. To say No to others is something many of us deeply fear. How can I say no to my boss or my colleague? I may risk my job, promotion or reputation, if I do that. Or, if I say no to my significant other, or the other people I love most in the world, will I still be loved and wanted? Can it be right to say no to my child, who may really want something? Or my neighbour or friend, perhaps alone and in need? We have been trained to think that in saying no we sever connection, or risk our belonging. We may have internalised that if I say No I will lose the love and relationship in some form or another. And so our lives fill up. We say yes to making a cake for the bake sale, yes to the car-pool, to staying late at work, to taking on another project, to the weekend away with our in-laws, to the party we don’t want to attend or to volunteering at the community event we have no time to be at. Or, we acquiesce to the touch that may not feel comfortable or to a friendship that fails to nourish. Or, a team philosophy we are not behind. Without firm No’s we start to lose ourselves and what we value. We fail to show who we truly are and what we really feel or need or want; and lose intimacy and authentic relationship along the way. We shoulder it all, feeing increasingly burdened, resentful, and overwhelmed. Simultaneously reducing much of the joy that was initially in the connection and belonging we think we are so scared to lose. But, until we know and express our own No, our Yes cannot actually be trusted. If there is never room for No in relationship, what kind of connection are we actually living in? With no room for No, my request becomes a demand. With no room for No, both people’s needs and desires are not in the equation. Learning to own our No’s is an essential leadership skill, relationship skill, parenting skill – Life skill. Holding our own boundaries is core to authentic relationship. 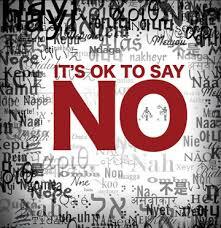 Embodying our No’s allows for accepting and respecting another’s No to us. Recently a colleague asked a favour of me. I wanted to say yes, to accommodate his need. I felt selfish saying no and could find no good reason inside myself for why I wouldn’t say yes. In the past, I would have just said yes, and let a low level resentment run behind the scenes of our interaction, which in turn would have contaminated our relationship. I would have faked a “happy to help” quality and whilst it may have been a good enough fake for him not to be able to articulate fully what was going on, he would have felt it somewhere. Because we do. We can sense when someone is helping us out or contributing from a non-genuine or overwhelmed place. Instead I dared to share my No with him. And, contrary to my fearful internal dialogue, he was absolutely fine with my decision. And he simply asked someone else to help – someone who seemed genuinely happy to be asked and to help. I am learning that I am a better colleague, parent, partner and friend when I am authentic and say what I really feel and need. We don’t need a reason for our No’s, the absence of a felt Yes is “reason” enough. “But won’t that make me selfish?” is the question we then often think. I meet that response more frequently in my coaching, work and friendships than any other. It’s as if “selfish” is the worst crime imaginable. The dictionary definition of selfish is “to be concerned exclusively or excessively with oneself”. Not something those of us with poor boundaries who are not in touch with our No’s tend to need to fear! In saying No, it is true we may risk connection. Some people in our lives may get provoked, may react or even leave. But, that in itself will tell us much about the quality of the relationships we currently sit in. And, knowing how to embody and then articulate our No’s and Yes’s consciously is also the fast track to intimacy and authentic relationship – professional or personal. It is our boundaries and conscious Yes’s and No’s that tell people who we are, and train people how to be with us. 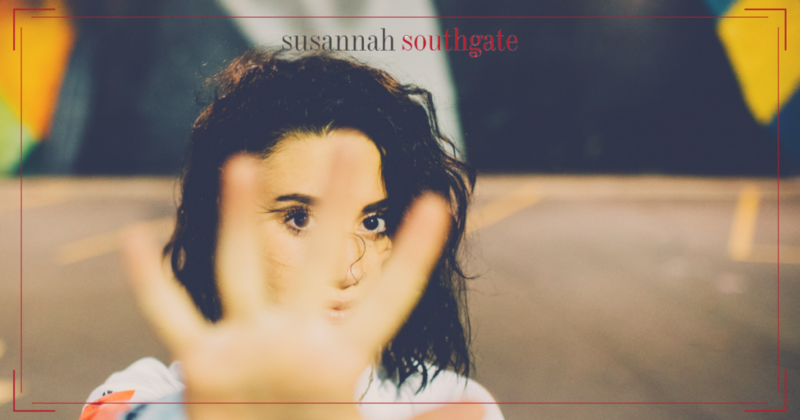 When we are able to trust the other to express their boundaries, needs and desires cleanly and consciously, and we can do the same, relationships at work and at home transform and thrive. It is up to us and only us to teach each other our boundaries in each exchange. Being able to feel, know and then articulate our No’s is essential to that endeavour. There is great relief in being with people, teams and organizations solid in that commitment. Here’s a simple exercise I use to support clients in becoming more conscious of their habituated Yes’s and more skilful in their No’s. Feel free to try it out in your own life. First, observe (without judgement) your interactions through the week and notice how often you automatically say “Yes” to others versus how often you say “No”. Notice how many of these Yes’s genuinely feel conscious, joyful and healthy. And if they are not that, what are they? Notice what are the feelings, sensations and emotions behind many of your Yes’s. Does your body contract or expand when (or just after) you say yes, does your heart feel open or closed, do you feel resentment or joy? Track it and notice. For those Yes’s that do not feel conscious, joyful and healthy, ask yourself “What had me say Yes when I wanted to say No”. Dig beneath the first answer you may get – your thinking mind will likely respond with something reasonable. But this is a deep inquiry and requires some real self-reflection. Journal your answers on as many occasions as possible: a pattern of Self will likely start to reveal itself. On each occasion of an unconscious Yes ask yourself: “In saying Yes to the other what am I saying No to for myself?” (It may be No to relaxing, No to having fun, No to prioritising you, No to space, No to being disliked). Explore through journaling your answers and inner landscape without judgement. Finally, look for opportunities in your life to practise a conscious No. Try to speak your No, without defence, apology or explanation. Notice how it feels to say No consciously versus reactively. How does it feel to be boundaried? Keep practising working towards your Yes’s becoming more authentic, conscious and joyful. Working towards giving yourself ever more permission and inner kindness for your No. Just like asking for help, really being solid and without apology in our No’s takes practice and commitment. Once embodied, it is highly transformative and inspirational. Yes to knowing our values, dear Marta! I hope all is well and good for you – lovely to see your name and thoughts.